You may have noticed that the only candle brand I’ve ever reviewed was Slatkin & Co. That’s because I’ve never owned any other candles…until now! I was recently introduced to AQUIESSE, which is a luxury home fragrance brand founded by Michael Joseph. I never heard about them before. AQUIESSE fans include celebrities such as Nicole Kidman, Jennifer Lopez, Prince, Denise Richards, Tori Spelling, Ali Landry, and Ben Stiller. Let me tell you a little about my thoughts on the AQUIESSE Luxe Linen Candle. More Information: The official AQUIESSE website is currently under construction, but is supposed to launch soon. I’m not sure if they’ll later offer online shopping. You know when you wash your clothes and hang them up to dry on a sunny day? That’s what the Luxe Linen candle by AQUIESSE smells like to me. It definitely is very fresh and clean-smelling like a pleasant laundry detergent. When I smelled it directly from the tin without burning it first, it had a perfume-y quality. 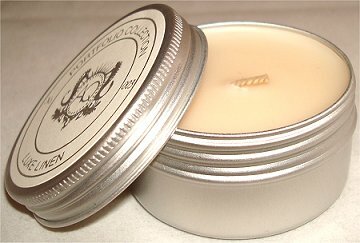 I found that the scent was much softer when I lit the candle compared to the way it smelled right out of the tin. I agree with the product claims that it’s a relaxing scent. I associate this smell with happy times and warm weather. 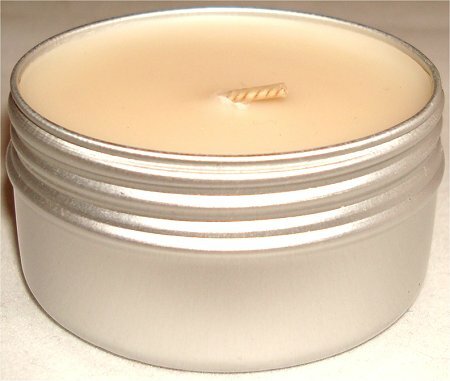 The linen scent is definitely there, the sandalwood makes it an inviting fragrance, and the slight herbal notes I can detect make me think of the outdoors. The scent while lit was very light – much lighter than when I smelled the cold candle. But I didn’t expect it to be really strong considering how tiny it is. This size is only suitable for a very small room. If you use it in a large, open area, you’ll hardly smell it. When I left it opened in a very small room, I could smell it a little even when it was unlit. But it’s by no means a heavy or strong scent. I’m pleased to say that it burned cleanly and evenly. Also, I was surprised that despite it being such a small candle, it lasted a long time. I burned it for 3 hours straight the first time and then a second time for about 4 hours. The wax only went down slightly – about a quarter of an inch. According to PR, the small travel candle has an average burn time of 20+ hours. That sounds pretty accurate based on my experience with this candle. 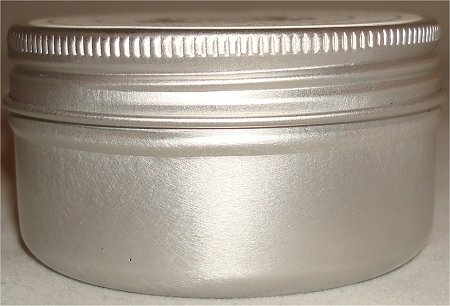 The mainly silver tin packaging is very elegant and simple. The best way for me to describe the label design on the lid is beachy royalty! I know that sounds strange, but the seahorses remind me of the water and the beach, yet the classy emblem looks really rich. I love how the lid screws on securely. This AQUIESSE candle is definitely great for traveling with because you don’t have to worry about the lid accidentally popping off in your suitcase. The only strange thing is that nowhere on the tin does it say exactly how many grams (or ounces) there are in this candle. I did research online to find out. This retails for around $5 USD, which is definitely not a lot, but compared to other scented candles in a similar size, it’s a bit more. It’s probably because the packaging is really sturdy and doesn’t feel cheap. 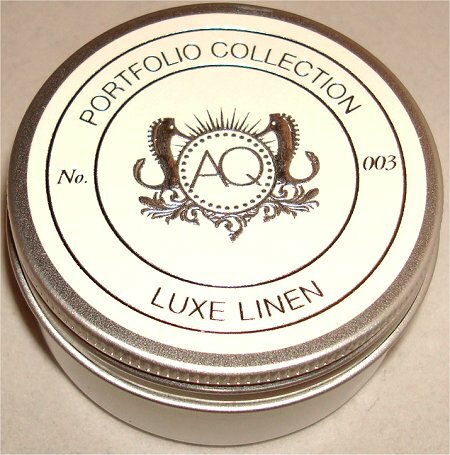 The AQUIESSE Luxe Linen travel tin scented candle has a perfume-y, fresh laundry detergent kind of fragrance that reminds me of happy childhood memories. And I like the sleek packaging and the screw-on lid. But what ultimately made me deduct major points was that the scent throw was very weak and is mainly suitable for very small rooms. This is a scent that would be much more impressive in a larger size. Have you tried any AQUIESSE scented candles? Do you like fresh fragrances that smell like just-cleaned laundry? Do you ever take your candles with you when you travel? This entry was posted in Candle Reviews, Fragrance Reviews, Product Reviews and tagged AQUIESSE on October 13, 2011 by Mary S..
Love the packaging! Is it metal tho? If it is, does it heat up when the candle is lit? That might be a problem if you just leave on a nice counter top. I’ve had that happen to me once and I was left with a really bad mark on a wooden surface. That’s too bad it didn’t have a better scent throw or value for price. I like how it’s organic and I can be a sucker for packaging but if it doesn’t provide as much scent..maybe not. Any chance we’ll have better luck with a different scent? It seems to be a very thin tin. Since this was a very small candle, it didn’t get too hot, although there was a note of caution on the base of the container saying that it would get hot. I burned it on a desk that’s made out of wood and it didn’t leave a mark. But I also used its lid as a ‘coaster’ of sorts. You raise a really good point – I wonder if this is an issue with the larger candle that gets much hotter. The design of the tin is lovely. It’s a cute change from the glass jars….though I’m sure it’s much safer to have them in glass. I love the two seahorses on the cover. Yes I can’t imagine ben stiller lighting up a scented candle either, but who knows what he does in private. I took a look at their small and large candles – those are in glass. 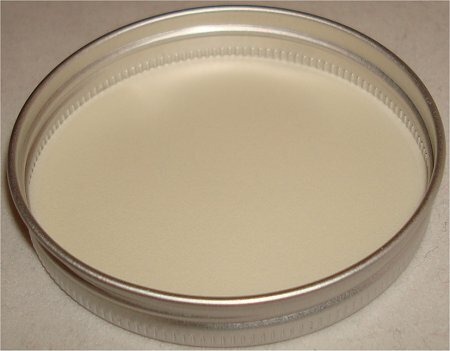 I think it’s just these travel tins that are packaged like this. I have been using the Luxe Linen scent in their reed diffuser version. it is a light and lovely scent, enough to know that that there is a scent in my home, but not so strong or overwhelming that it’s obvious or annoying. I don’t smell it in the back (bedroom) area of my home.